Today I decided to style a pretty Fall table for a little dinner of ours... and I wanted to share a few easy ideas you might use. You probably won't believe this, but I haven't bought a single pumpkin yet. beginning with warm caramel and shiny, red apples. Yep, I made me some homemade caramel apple place cards! I used real sticks--actually had to cut some branches from my yard to get them, and basically followed the directions on the caramel bag. It's been a while since I've made these and since I wanted the apples to sit fairly flat on the plates, I decided to dip the tops. Before I dipped the apple I used a knife to make a slight hole in the top and then used the stick to push deep enough for the stick. After the hole in the top was ready for the stick, I turned the apple over and used a butter knife--gently inserted--not too deep---to dip and swirl the apple in the warm caramel before placing it on a paper plate. I found that it was less messy to have the hole for the stick already in the apple before dipping.. The stick goes in right away. Next I wrapped a piece of rough Jute string around the stems --mostly for texture-- and tied a Kraft tag to the Jute string. I stuffed the heavy duty brown paper--the same stuff I used for the table runner--around the dirt as a filler for the apples to sit on (I used real ones), then I added green moss into any cracks and voila! Are you liking some of my favorite Fall items? Next I added plaid napkins from Target. And then I used whatever I had. White dishes, wood lantern, stemware, Pier One placemats....already had. I used some old music sheets rolled into scrolls and added some fresh apple votives. I like using my bar cart for soup tureen, bowls and spoons. It's a simple table---and with the paper runner it's definitely casual, but I hope I gave you some ideas you can use. Have you started decorating for Fall already? Your table is filled with ideas and inspiration and I love it. I appreciate nature's simple seasonal items, your apples, twigs and berries and the end result is so pretty and inviting. The mums and apples in the copper colanders is so clever. Great job! OMG!!! Your tablescapes are always so gorgeous. I love the idea of the white flowers with the apples. Oh my gosh, you had me at the caramel apples! LOL Gorgeous. OH MY Leslie...how I would love to dine there! 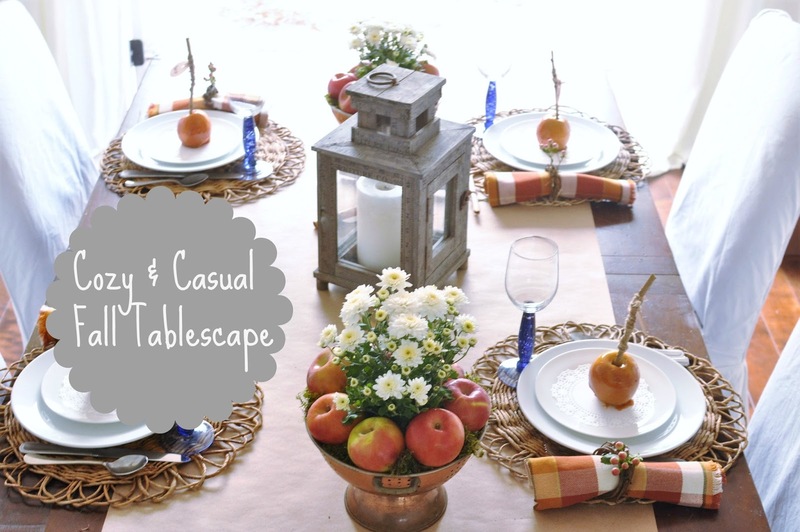 You did a creative, beautiful fall table that would make anyone feel welcome. Such a gorgeous space...and I love the bar cart idea for serving! I think we could use our cart like that! Oh. So. Wonderful. SAD to say we do not get TRICK OR TREATERS SO I DONOT GO ALL OUT ANYMORE! I will buy a pumpkin but not YET!IT is 95 here today at 3:OO. I am NOT much of a seasonal decorator................never have been unless it is CHRISTMAS! This is so sweet! I would love to come for dinner and sit at this beautiful table and of course to munch on one of your delicious and creative apples as well. I hope that you are having a beautiful week. I might just copy your idea of the colander full of apples. PS-I just launched my new curated travel agency and I have a fun giveaway going on to celebrate. Hope you can stop by and enter! I'm drooling for one of those apples! LOVE your centerpieces of apples and mums. Have a great week, Leslie. The caramel apples are perfect!